Luis Tiant was a starting pitcher for 19 seasons (1964-82). 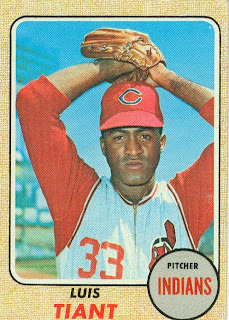 He was a member of the Cleveland Indians’ rotation during the 1960s (which is how I always identify him). The middle (and probably more famous) part of his career was spent with the Boston Red Sox, where, in addition to having three 20-win seasons, he won 18 games in 1975 for the AL champs and was 3-0 in the post-season. Tiant is also famous for his patented 180-degree “face the center fielder” pitching windup motion. Luis began his pro career at age 18, pitching for the Mexico City Tigers from 1959-61. 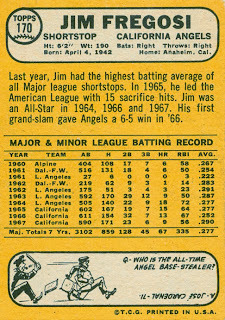 The Tigers sold him to the Cleveland Indians before the 1962 season. Tiant pitched on the Indians’ farm for 2 ½ seasons. He won 14 games in 1963 for the Tribe’s single-A team, and was 15-1 in just the first half of 1964, pitching for triple-A Portland (OR) Beavers. Tiant was called up to the majors in mid-July 1964, and won another 10 games with Cleveland, primarily as a starter. 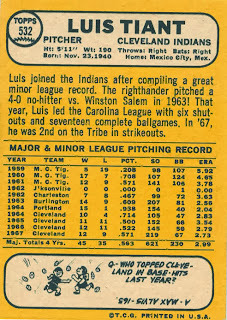 Except for parts of the ’65 and ’66 seasons, Luis was always a starter during his time with the Indians, which lasted through the 1969 season. 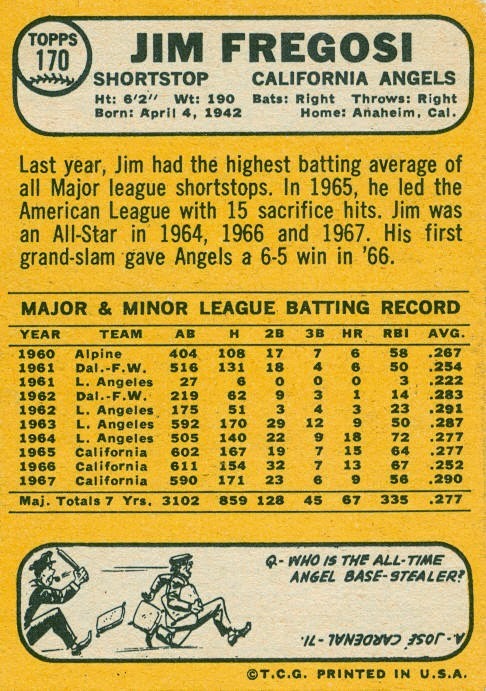 In 1968 he won 21 games, and led the AL with a 1.60 ERA and 9 shutouts, while making his first all-star team. The following year, he lost 20 games, and was dealt to the Twins after the season with pitcher Stan Williams for pitchers Dean Chance and Bob Miller, 3rd baseman Graig Nettles, and outfielder Ted Uhlaender. Luis lasted only one season in Minnesota. He was 6-0 by the end of May, but broke a shoulder blade, sidelining him until early August. 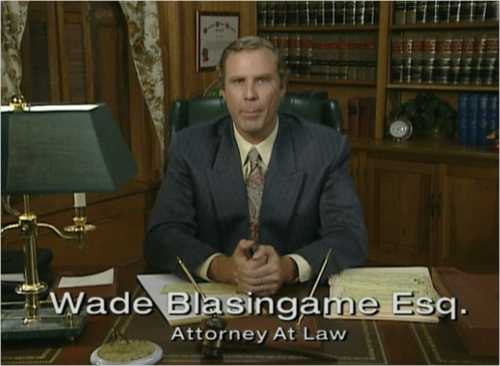 He was ineffective after returning, finished up at 7-3, and was released the following March. Tiant was picked up by the Braves in mid-April, and assigned to triple-A. Released a month later, he was then signed by the Red Sox. Boston had him tune-up in triple-A for a month, then called him up to the Sox in early June. Luis started 10 games in his first 6 weeks with the team, then was relegated to the bullpen for the final 2 months of the season. In 1972, he began a string of 7 consecutive seasons with 12 or more wins for the Red Sox. Luis again led the AL with a 1.91 ERA, while winning 15 games. He won 20 and 22 games in the next 2 seasons. In the 1975 AL Championship season, he compiled an 18-14 record and led his team in starts, innings pitched, and strikeouts for the 3rd consecutive season. Tiant was 1-0 in the ALCS and 2-0 in the World Series. He played 3 more seasons in Boston, winning 21 games in 1976. After the 1978 season, he was granted free agency, and signed with the Yankees. After one good and one so-so season in New York, free agency took him to the Pirates for the 1981 season. He spent most of the season at triple-A Portland (where he had been in 1964), and was called up to the Pirates for the last 6 weeks of the season, starting 9 games. Tiant finished his career back where he started – playing in Mexico in 1982 and 1983. 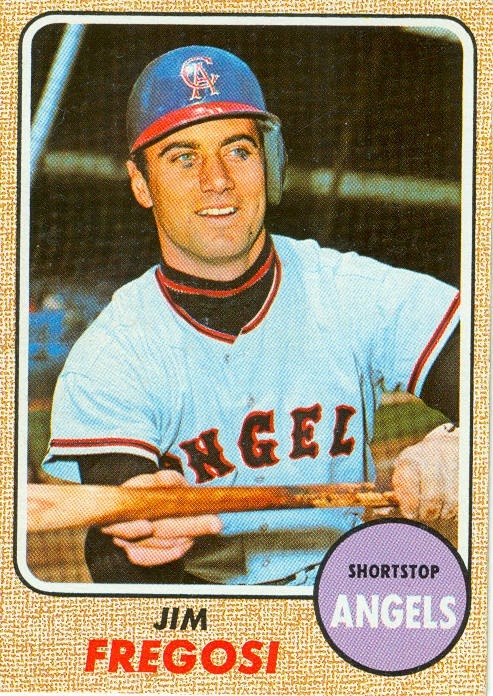 He also played 6 games for the California Angels at the end of the 1982 season. Although Cuban, Tiant was inducted into the Venezuelan Baseball Hall of Fame in 2009. 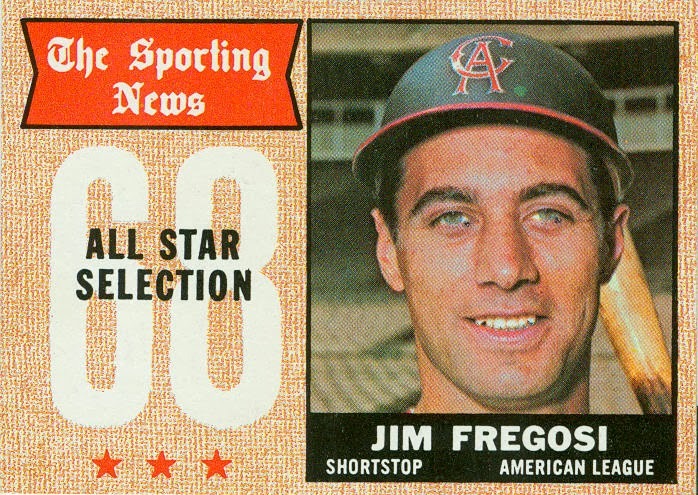 A quick look at the cards of Jim Fregosi, who passed away on Friday. 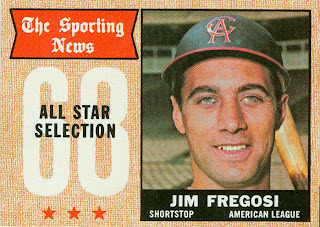 I was a bit surprised that Fregosi was selected to the 1967 All-Star team. 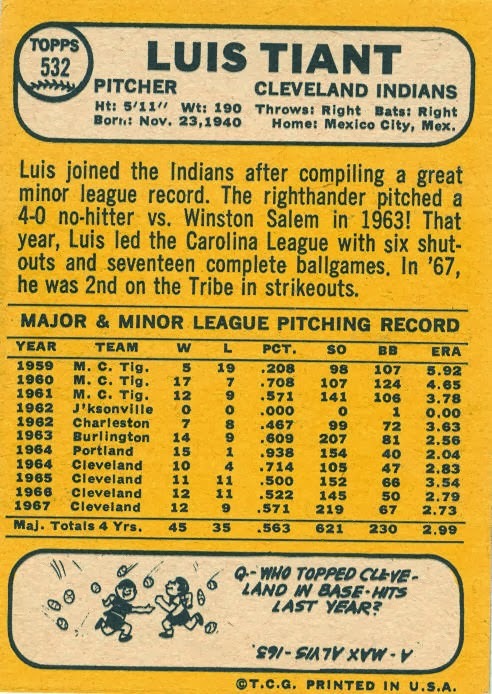 Luis Aparicio had the advantage of his reputation, and a 1966 World Series championship behind him, but as the back of Fregosi's base card says, he led all shortstops in 1967 with a .290 batting average. 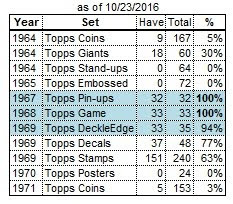 I previously posted Fregosi's 1966 and 1967 cards to those blogs. Rest in Peace, Jim Fregosi. Since October, I’ve been playing catch-up with the teams that haven’t been represented as much as others on my blogs. 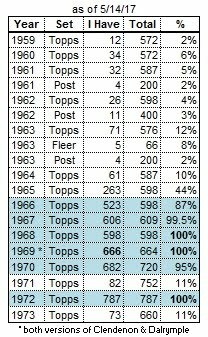 On the 1968 blog, all teams have at least 4 posts except the Braves…until now. 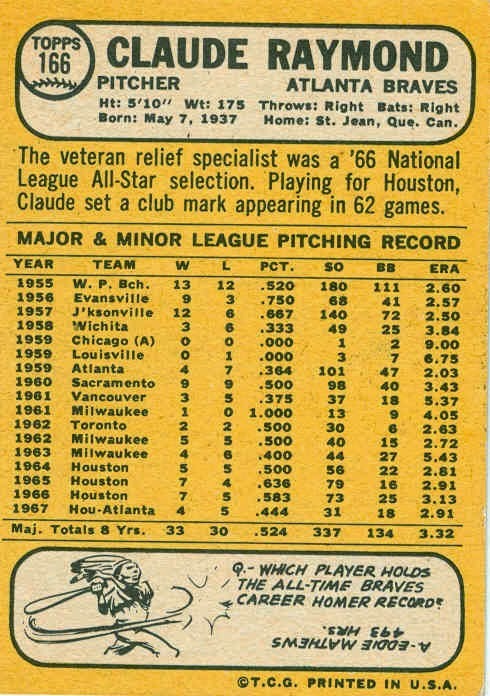 Claude Raymond had a 12-year career (1959, 1961-71) as a relief pitcher. In 449 games, he only made 7 starts – all in 1965 for the Astros. A French-Canadian from Quebec, he would play his final 2 ½ seasons with the fledgling Montreal Expos, becoming the ultimate hometown favorite. Raymond was signed by the Milwaukee Braves in 1955 and played in their farm system from 1955 to 1962. His minor-league stint was briefly interrupted when the White Sox selected him in the Rule 5 draft in December 1958. He began the 1959 season on the White Sox roster, but after pitching in 3 games, he was returned to the Braves in May. For 3 ½ seasons, Raymond labored in Houston’s bullpen, along with veterans Jim Owens and Hal Woodeshick. 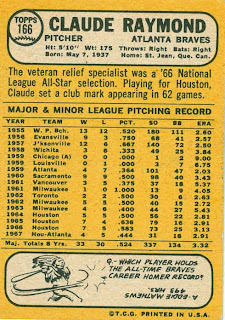 In 1966, Claude advanced to the closer’s spot, leading the team with 16 saves. 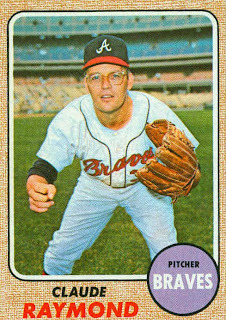 In June 1967, he was returned to the Braves in exchange for pitcher Wade Blasingame (not that one). In his only full season with the Braves (1968) he collected 10 saves, 2nd-most on the staff. Raymond was sold to the expansion Expos in August 1969, and immediately became a fan favorite, due to his French-Canadian heritage. He led the staff with 23 saves in 1970, but in his final season (1971) he took a back seat to Mike Marshall.